Tokyo Police Club | © CARAS iPhoto Inc. 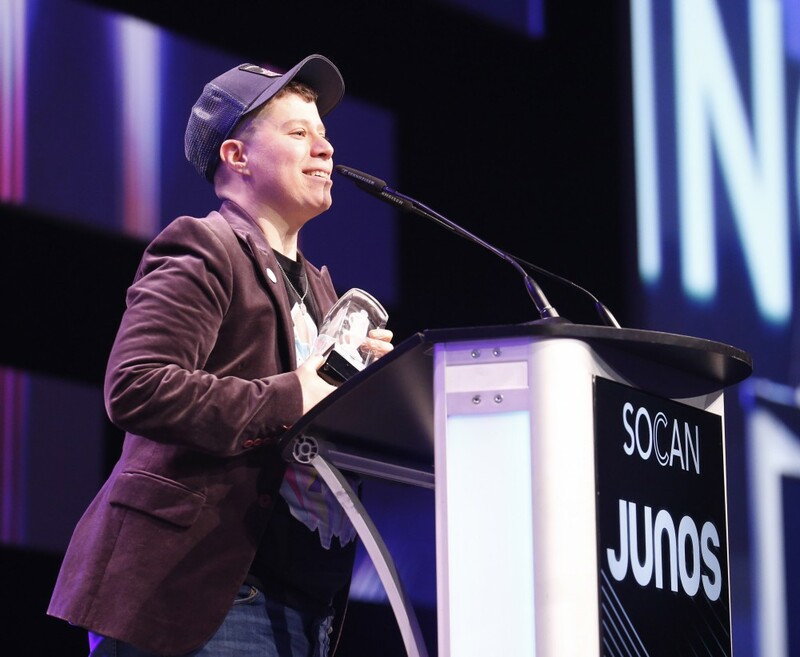 The 2019 Video of The Year winner went to Ali Eisner for their video “No Depression,” for Juno Award-winning Toronto singer and songwriter Bahamas, aka Afie Jurvanen. The video, which was beautifully shot on Kashe Lake in Ontario, follows Bahamas’ tongue-in-cheek approach to depression, with lyrics like “I give the doctor a description/ And he just writes a prescription/ Or two.” Ali brilliantly uses puppets to deal with more serious issues, and this video is no exception. Watch the video now. Ali Eisner | © CARAS iPhoto Inc.
Ali J. Eisner has worked extensively both in front of and behind the camera for more than two decades as a director, creative producer, writer, television puppeteer and composer. 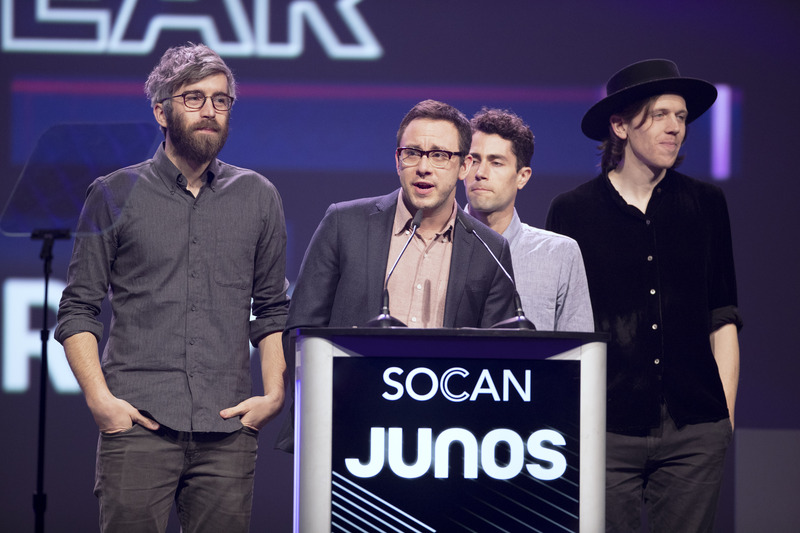 The 2019 JUNO Award winning and three-time-GEMINI Award nominee has created a variety of network shows for CBC, TV Ontario, FOX, Disney and NBC, in addition to extensive work with musicians, collaborating in a wide range of mediums. Eisner was the creator of Mamma Yamma for CBC Television, and was a director and supervising producer for The Sunny Side Up Show on PBS Kids Sprout. In partnership with Taqqut Media & Inhabit Education, Ali has traveled throughout Northern communities in Nunavut, teaching puppetry to school-age kids. 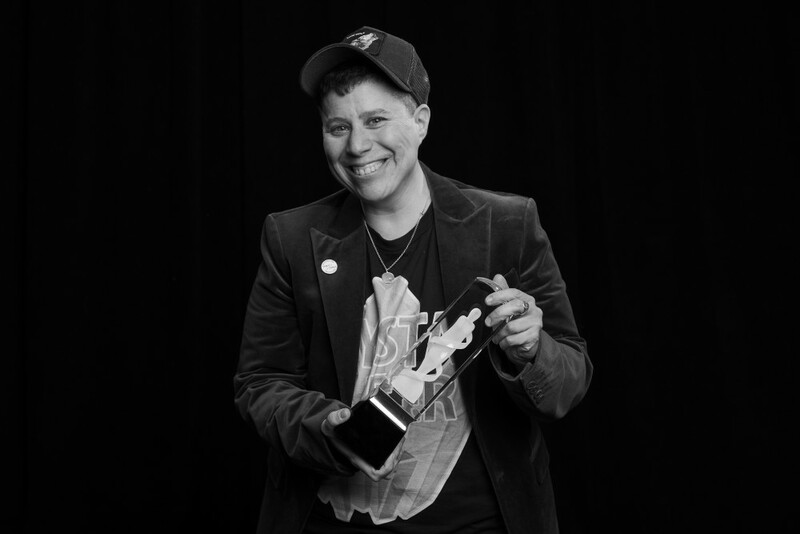 Eisner also identifies as transgender/non-binary and brings awareness to LGBTQ issues through their broadcasted works across a multiplatform career. So many. My folks gave me an Ernie Puppet at a very young age. It was always with me - I’d make it talk to everyone in a variety of voices. More artistic memories - painting with my mom and playing with all my dad's cameras. I'd snap the shutter for hours, even if the camera wasn't holding any film. I remember looking for neat ideas through the lens and for any composition that made me laugh. I also used to sit with a tape deck, playing random tunes for hours, speaking into a tube of toothpaste pretending I was a professional DJ. Where/When did you become an artist professionally? When I was 21 (I’m 45 now), I started as a morning kids host on YTV. I was that human in between the cartoons, talking to the kids at home and connecting with them emotionally and creatively. From there, everything took off, and I’ve been working in kids’ TV ever since. Since that time, I’ve had super fun runs making all kinds of on-air programs at NBC, CBC, TVO, PBS, FOX - really wherever there’s fun work, I’ll travel. Right now, I’m super focused on being my own boss. At the moment my main influence is being in nature. Big nature. Forests, mostly. I currently live in the city, so i’m really blown away at what each visit brings me. A bunch of chill, low-frequency time does wonders for me creatively. It really helps me dig deep, to see where I’m at, to reflect and focus. For me it supports authenticity. In terms of human influences: my favorite puppeteer is Frank Oz - I could watch his puppetry for a billion flamillion hours on end. At different ages I believe I’ve had a variety of neato human influences - looking back, they’ve mostly been musicians. My favorites to date are still Stevie Wonder & Joni Mitchell. They speak the words and feel all the feelings. How did you come to do the music video for Bahamas? I’ve known Afie for about 5 years now. The more we’d hang out with each other, we'd discover that our sense of humor was super similar. The vibe with Afie is super easy and relaxed. I just love him as a musician and as a human. He’s seen/known about my past work, so he approached me about the idea of creating a puppet music video for him and I was so super jazzed to make it happen. The process of working with Afie was dreamy. So easy. He just trusted me and let me do whatever I wanted. He’s not precious - and as an artist who loves to see how far I can go, that’s a great space to work in. The video and song deal with issues of depression, what is your best advice for those coping with these life issues? I’m going to buy a touch more camera gear so I can create some new things to watch. I have my eye on some new lenses - and maybe a larger travel bag so I don’t have to carry 18 thousand napsacks everywhere I go. I’ll also probably also buy some flowers, ukuleles and dinner for folks I know who are dealing with depression. If you had to live inside a music video for the rest of your life, which would it be and why? There are just so many music videos I love, so that’s a tough question! Wait - does a live performance count? There's a video that changed my life when I was 11 years old that is super meaningful to me. I was sitting in my folks’ living room, watching the 1983 Grammy Awards. Annie Lennox surprised North America- instead of performing as herself, she appeared singing as her alter ego, Earl, singing “Sweet Dreams”. She wore a handsome suit, sideburns and an Elvis-inspired haircut. She had a special flavour of swagger on stage that was so charming and bold, gender-wise. She was pushing boundaries in the mainstream, hard. As a little trans kid, I was watching in SHOCK - I was intensely connected to the performance in a way I could not then, at 11, describe. Her gender bend spoke volumes to me - it was the first time I had seen something of that nature - it felt like I was intimately experiencing watching my own feelings being reflected back to me. It made me feel not as alone. I can even remember what i was wearing. Oh. And I was eating jiffy pop.